RODINO, Peter Wallace, Jr., a Representative from New Jersey; born in Newark, Essex County, N.J., June 7, 1909; attended the McKinley Grammar School and Barringer High School; graduated from the University of Newark and from the New Jersey Law School in 1937; was admitted to the bar in 1938; lawyer, private practice; teacher, public speaking and citizenship classes, Y.M.C.A. and Federation of Clubs, Newark, N.J., 1930-1932; managing editor of the Jersey Review in 1934 and 1935; United States Army, 1941-1946; served with the First Armored Division in North Africa and Italy and on military missions with the Italian Army; awarded Bronze Star for military operations, War Cross, and Knight of Order of Crown from Italy; unsuccessful candidate in 1946 to the Eightieth Congress; elected as a Democrat to the Eighty-first and to the nineteen succeeding Congresses (January 3, 1949-January 3, 1989); one of the managers appointed by the House of Representatives in 1986 to conduct the impeachment proceedings against Harry E. Claiborne, judge of the United States District Court for Nevada; one of the managers appointed by the House of Representatives in 1988 to conduct the impeachment proceedings against Alcee Lamar Hastings, judge of the United States District Court for the Southern District of Florida; chairman, Committee on the Judiciary (Ninety-third through One Hundredth Congresses); was not a candidate for renomination in 1988 to the One Hundred First Congress; professor, Seton Hall University Law School, Newark, N.J., 1989 to 2005; died on May 7, 2005, in West Orange, N.J; interment in Gate of Heaven Cemetery, East Hanover, Morris County, N.J. Oral History: 1981, 314 pages. The oral history includes the reminiscences of Peter Wallace Rodino, Jr., from 1981. The interview is currently closed. Papers: 1949-1988, 800 cubic feet. The papers document the career of Peter Wallace Rodino, Jr. 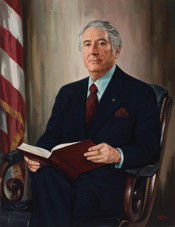 The Archives are comprised of legislative records, press and campaign materials, constituent correspondence, photographs, scrapbooks and audio-visual formats that span the life of Peter W. Rodino, Jr. with the bulk of the material reflecting his work in Congress from 1949 - 1989. A finding aid is available in the repository and online. Fields, Howard. High Crimes and Misdemeanors: The Dramatic Story of the Rodino Committee. New York: W.W. Norton and Company, 1978. Rodino, Joy. Fifty-Two Words My Husband Taught Me. West Orange, N.J.: DRJ Publishing Inc., 2009. Rodino, Peter. "Federal Criminal Sentencing Reform" Journal of Legislation 11 (Summer 1984): 218-36. ___. "The Legislative Veto and the Balance of Powers in Washington." Parliamentarian 65 (January 1984): 22-30. ___. "Living With The Preamble." Rutgers Law Review 42 (Spring 1990): 685-700. ___. "Magistrates' Reform: A Way to Aid Congested Federal Courts. : Trial 13 (November 1977): 32-35. ___. "The Proposed Balanced Budget/Tax Limitation Constitutional Amendment: No Balance, No Limits." Hastings Constitutional Law Quarterly 10 (Summer 1983): 785-807.